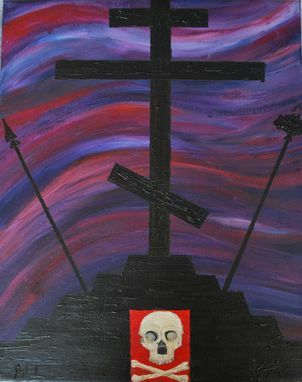 Abstract Painting: "Holy Friday: Stavros, The World Tree"
"He who hung the stars in the heavens now hangs from a cross." So Orthodox Hymnography describes this day, when Christ, the incarnate Son of God, Second person of the Holy Trinity, is crucified. The Cross becomes a tree of life, to replace that which was lost in the Garden of Eden at the fall of Adam. I wanted to echo in the title of this piece the story of the World Tree which exists in so many cultural myths as a precursor to the life-saving Cross; Ygdrassil, the Ceiba of the Mayans, and others. For Christians, this is our world tree. This is the tree where God hung, nailed by others, for our sins. This was the fount of our salvation. The sky is darkened. The world is waiting for what is to come. The design is partly based on the Great Schema, worn by Orthodox Monks upon their tonsure.